The relation between bankers & clients is created through which account is called bank account. If any individual wants to deposit his accumulated money in bank, he is to open a bank account with his name that hold a particular number which is his identity to bank and his deposited amounts are added to balance or withdrawal amount are deducted from his balance. In this way the money of a client are to be deposited or withdrawal with the help of which account is called bank account. 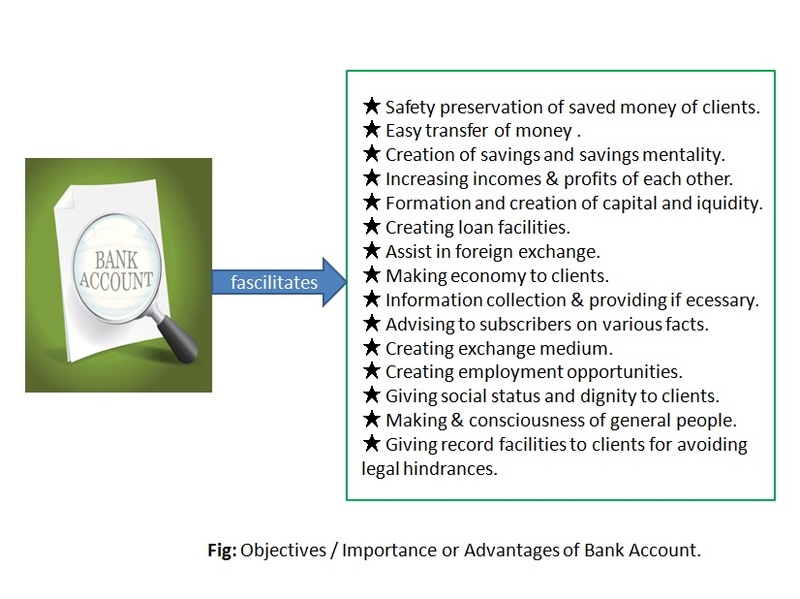 Moreover, a contract between banker & client is implemented through a bank account. * Bank account is a contractual relation between bankers & clients. * It is continued to a name with number. * The calculation of deposit & withdrawal are maintained and preserved here. * Clients separated & detected by this account. * The money of clients are preserved with safety & security through this account. Objectives / Importance or Advantages of Bank Account. ★ Safety preservation of saved money of clients. ★ Easy transfer of money from one place to another including foreign & domestic areas. ★ Creation of savings and savings mentality. ★ Increasing incomes & profits of each other. ★ Formation and creation of capital and liquidity. ★ Assist in foreign exchange. ★ Making economy to clients. ★ Information collection & providing if necessary. ★ Advising to subscribers on various facts for the interests of them. ★ Giving social status and dignity to clients. ★ Making & increasing consciousness of general people. ★ Giving record facilities to clients for avoiding legal hindrances.